If you’re looking for a new speaker set for your PC, Laptop or even your Tablet setup then I’m going to help you out and recommend a set for you. The Klipsch Promedia 2.1, from Klipsch (duh). Before we go any further I ‘ll just put it out there that this setup isn’t new and has been around since 2002. Yep, 2002! So why am I just now talking about them you ask? I typically use Logitech speaker sets for my main PC and as much as I’ve enjoyed them I wanted to try something else. Especially since my last set, the Logitech Z323, were on the way out and even before that I left they were a bit underpowered. Enter the Klipsch ProMedia 2.1 THX Certified Computer Speaker System. 1x subwoofer • 31Hz – 20kHz frequency response • 106dB output. So what’s a geek to do when their former speakers kick the bucket? Get a new set of course. After going up and down the isles of my not so local PC shop I finally decided on the Klipsch Promedia 2.1 and I’m glad I did. To be fair I did sample some of the Altec Lansing offerings as well and was actually going to replace my setup with the RAZER Leviathan soundbar but apparently, it doesn’t ship or hit stores until the end of December 2014 and most places are telling me they won’t get it until early 2015. Maybe next time. There’s not a whole lot going on with the Review: Klipsch Promedia 2.1 and all you’re getting in the box is a set of speakers (left/right), a sub-woofer and some wires. This is a strictly bare-bones package here so if you’re expecting some sort of dock, remote control or Bluetooth adapter then you’re going to be sorely disappointed. That said if you’re looking for a decent setup that won’t break the bank then this is exactly what the doctor ordered. With the Klipsch Promedia 2.1, the subwoofer adjustment knob is located on the right speaker as opposed to being located on the sub-woofer, which is great is you typically place your subwoofer on the floor. At least I hope you do since putting this beast on your desk or where ever your equipment is would do nothing but rock your world, in a bad way. Another nice touch is that the speakers connect to the sub-woofer via speaker wires and not an RCA connector or specialized jack. This adds two pluses to the speakers; You can replace/fix/extend the wiring from the speakers and you can also use banana connects on the end of the wire to connect to the sub-woofer which gives you a more dependable contact. the last part is something I recommend you do especially if you have little critters that like to hide under your desks such as dogs, cats or even little children. 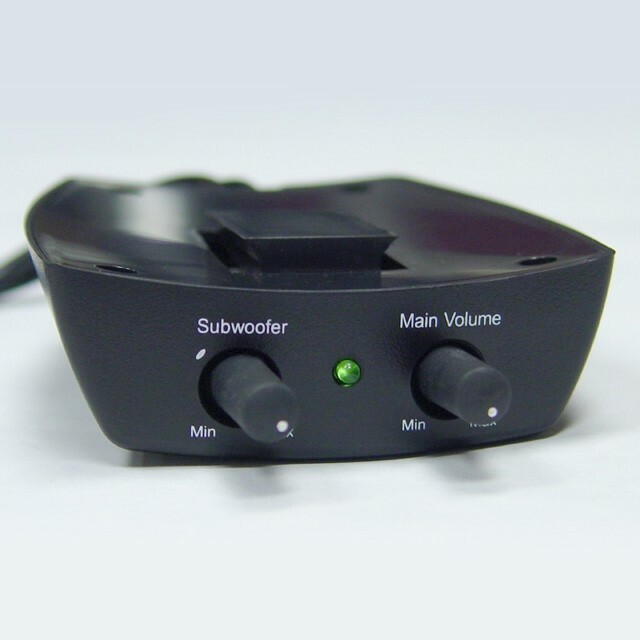 The speakers also feature a removal grill that exposes drivers and the right speaker also includes a headphone and an input that will allow you to connect an external device such as a mp3/iPod/Android device to it via mini-plug and an output for plugging a pair of headphones into the unit. Another nice touch is that the control module can detach and be replaced via Klipsch’s website instead of tossing the set into the trash. I’ve already ordered another one for reasons that make sense to me; kids and all that stuff that tend to break delicate electronic items. I’ve played a few games to test speakers out, mostly racing games (Need for Speed: Most Wanted, GRID: Autosport, Far Cry 4) few movies (Need for Speed, Black Hawk Down) and of course a few soundtracks (Gundam Build Fighters Original Soundtrack, EXIT TRANCE PRESENTS SPEED) just to see how well they performed. Every note was crisp, however, speakers were very responsive and the sub-woofer was constantly blasting out some explosive booms when it needed to. While this was a simple speaker upgrade it had transformed my movie watching and gaming and raised it to a higher level all while putting a smile on my face and cranking the sub-woofer up a notch or two allowed me to shake my office walls and floors, I even has a few things on my shelves hit the floor due to the bass production. My wife, on the other hand, did not appreciate the sound experience as much as I did… sorry honey! As an added bonus they’re also THX certified and they’re pushing 200 total watts (35 per channel / 130 watts peak @ the sub-woofer). Seriously I no longer have the need to go into my home theater if I want to fire up a quick movie session as this set can at the very least provide a worthy audio companion to its visual partner. While for the most part I was impressed by the Kilpsch Promedia 2.1, a few things did stand out. The first is that the speaker wires are of a very thin gauge and while it’s not a deal breaker I wish that it was of a thicker gauge, it’s at the limit where it’s just too thin for my tastes. The second is while the speakers and sub-woofer do a good job at what it does I notice that on certain highs and lows that it tends to falter. I’m also not a fan of the stand that the speakers sit on as it feels cheap and a slight press from the top of the speakers will make the stand bend downwards. The last is that these speakers are a tad on the large side however and depending on how much desk real-estate you have they take up more space than you would like. They aren’t as large as a home theater bookshelf speaker mind you but they’re still pretty big when it comes to PC speakers. Easily some of the best bookshelf speakers I’ve owned in a long time and I don’t see myself replacing these anytime soon. I love them, my wife, on the other hand, isn’t a fan. That means, they’re really good. Is the Kilpsch Promedia 2.1 worth it? You better believe it is! The Kilpsch Promedia 2.1 is a fantastic buy and can be found at $139.99 or below which is a testament of their staying power since when they originally went on sale back in 2002 they were selling for $159.99. Kilpsch hit the sweet spot with this 2.1 package and for the money, you could do worse than to pick this up. Decent highs and lows all while being accompanied with a nice looking design, the Kilpsch Promedia 2.1 is perfect as a replacement set or for the gamer/movie-goer looking to add a little more oomph to their PC, Laptop or Tablet setup. Just be sure NOT to crank it up when your significant other is trying to get some sleep. they may not appreciate it as much as you do!